Track #2 sums it all up. Oh ... my .... god ... Hov! 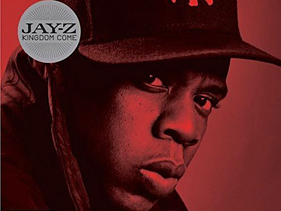 Jay-Z's out-of-retirement masterpiece, Kingdom Come, is one of two albums that I've been listening to for the last three weeks (the other one is Lupe Fiasco's Food & Liquor). For real. This album is sick. Backed by the team of hip-hop super-producers Just Blaze, Dr Dre, The Neptunes, Kanye West, and Swizz Beatz, Kingdom Come sounds like a Jay-Z album, while still sounding progressive and fresh. Just Blaze tracks have lots of crash cymbals and a jazzy feel. "Trouble" sounds like something for Linkin Park. The Neptunes sound like ... well, it sounds like the Neptunes ... what do you want?! Jiggaman seems to be more responsible and reflective. He's wise like old man Jon. In "Minority Report", Jay talks about the aftermath from Hurricane Katrina. In particular how poorly managed the rescue efforts were. In "Lost One", he questions whether he was responsible for the car accident that killed his nephew. Too many hip-hop albums are 12 tracks of braggadocio, but Kingdom Come comes with something more. And the gem of this album is his collaboration with Coldplay's Chris Martin, titled "Life is a Beach Chair." Coldplay and Hova? Oh snap! Only the god MC can pull this off. It's the ROC!